Angkor Wat is a temple complex in Cambodia. This largest religious monument in the world is on a site measuring 162.6 hectares. It was originally constructed as a Hindu temple of God Vishnu for the Khmer Empire, gradually transforming into a Buddhist temple towards the end of the 12th century. It was built by the Khmer King Suryavarman II in the early 12th century in Yaśodharapura (Khmer present-day Angkor), the capital of the Khmer Empire, as his state temple and eventual mausoleum. Breaking from the Shaiva tradition of previous kings, Angkor Wat was instead dedicated to Vishnu. As the best-preserved temple at the site, it is the only one to have remained a significant religious centre since its foundation. The temple is at the top of the high classical style of Khmer architecture. It has become a symbol of Cambodia, appearing on its national flag, and it is the country's prime attraction for visitors. Angkor Wat combines two basic plans of Khmer temple architecture: the temple-mountain and the later galleried temple. It is designed to represent Mount Meru, home of the devas in Hindu mythology: within a moat and an outer wall 3.6 kilometres long are three rectangular galleries, each raised above the next. At the centre of the temple stands a quincunx of towers. Unlike most Angkorian temples, Angkor Wat is oriented to the west. The temple is admired for the grandeur and harmony of the architecture, its extensive bas-reliefs, and for the numerous devatas adorning its walls. Angkor Wat lies 5.5 kilometres north of the modern town of Siem Reap, and a short distance south and slightly east of the previous capital, which was centred at Baphuon. In an area of Cambodia where there is an important group of ancient structures, it is the southernmost of Angkor's main sites. The initial design and construction of the temple took place in the first half of the 12th century, during the reign of Suryavarman II (1113 –1150). Dedicated to Vishnu, it was built as the king's state temple and capital city. Neither the foundation stela nor any contemporary inscriptions referring to the temple have been found, its original name is unknown, but it may have been known as "Varah Vishnu-lok" after the presiding deity. Work seems to have ended shortly after the king's death, leaving some of the bas-relief decoration unfinished. In 1177, approximately 27 years after the death of Suryavarman II, Angkor was sacked by the Chams, the traditional enemies of the Khmer. Thereafter the empire was restored by a new king, Jayavarman VII, who established a new capital and state temple (Angkor Thom and the Bayon respectively) a few kilometres to the north. Towards the end of the 12th century, Angkor Wat gradually transformed from a Hindu centre of worship to Buddhism, which continues to the present day. Angkor Wat is unusual among the Angkor temples in that although it was somewhat neglected after the 16th century it was never completely abandoned, its preservation being due in part to the fact that its moat also provided some protection from encroachment by the jungle. In the mid-19th century, the temple was visited by the French naturalist and explorer Henri Mouhot, who popularized the site in the West through the publication of travel notes, in which he wrote: "One of these temples—a rival to that of Solomon, and erected by some ancient Michelangelo—might take an honorable place beside our most beautiful buildings. It is grander than anything left to us by Greece or Rome, and presents a sad contrast to the state of barbarism in which the nation is now plunged." Mouhot, like other early Western visitors, found it difficult to believe that the Khmers could have built the temple and mistakenly dated it to around the same era as Rome. The true history of Angkor Wat was pieced together only from stylistic and epigraphic evidence accumulated during the subsequent cleaning and restoration work carried out across the whole Angkor site. There were no ordinary dwellings or houses or other signs of settlement, including cooking utensils, weapons, or items of clothing usually found at ancient sites. Instead there is the evidence of the monuments themselves. Angkor Wat required considerable restoration in the 20th century, mainly the removal of accumulated earth and vegetation. Work was interrupted by the Cambodian Civil War and Khmer Rouge control of the country during the 1970s and 1980s, but relatively little damage was done during this period. Camping Khmer Rouge forces used whatever wood remained in the building structures for firewood, a pavilion was ruined by a stray American shell, and a shoot-out between Khmer Rouge and Vietnamese forces put a few bullet holes in a bas relief. Far more damage was done after the wars, by art thieves working out of Thailand, which, in the late 1980s and early 1990s, claimed almost every head that could be lopped off the structures, including reconstructions. 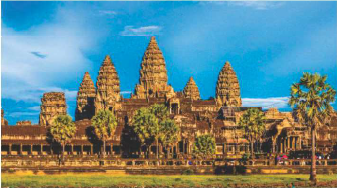 The splendid artistic legacy of Angkor Wat and other Khmer monuments in the Angkor region led directly to France adopting Cambodia as a protectorate on 11th August 1863 and invading Siam to take control of the ruins. This quickly led to Cambodia reclaiming lands in the northwestern corner of the country that had been under Siamese (Thai) control since AD 1351 or by some accounts, AD 1431. Cambodia gained independence from France on 9th November 1953 and has controlled Angkor Wat since that time. It is safe to say that from the colonial period onwards until the site's nomination as UNESCO World Heritage in 1992, this specific temple of Angkor Wat was instrumental in the formation of the modern and gradually globalised concept of built cultural heritage.